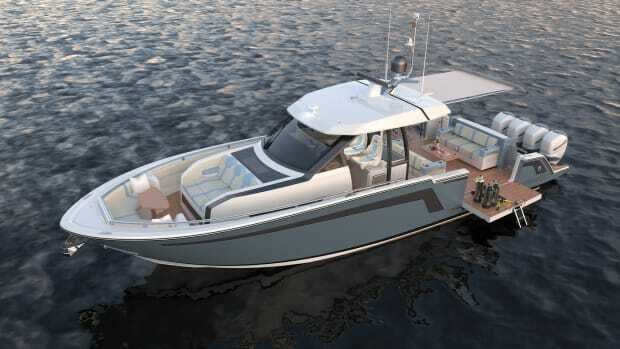 The custom builder’s flagship model is equipped with a multitude of fishy and lifestyle features. 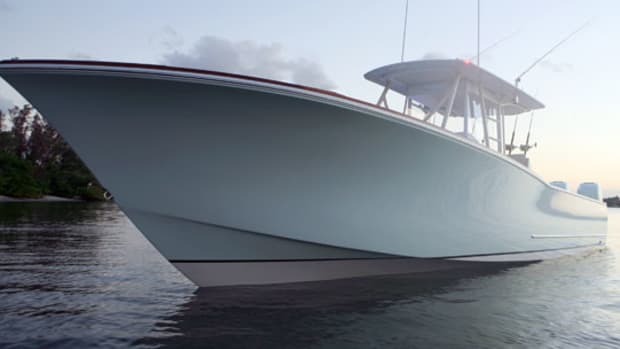 A family project that began 15 years ago to build a center console evolved into Bonadeo Boatworks. They’ve since earned a reputation for fetching vessels inspired by the custom Carolina and South Florida schools of design. “We took all of our favorite parts and looks and blended them together,” says Tony Bonadeo, son of founder Larry Bonadeo. 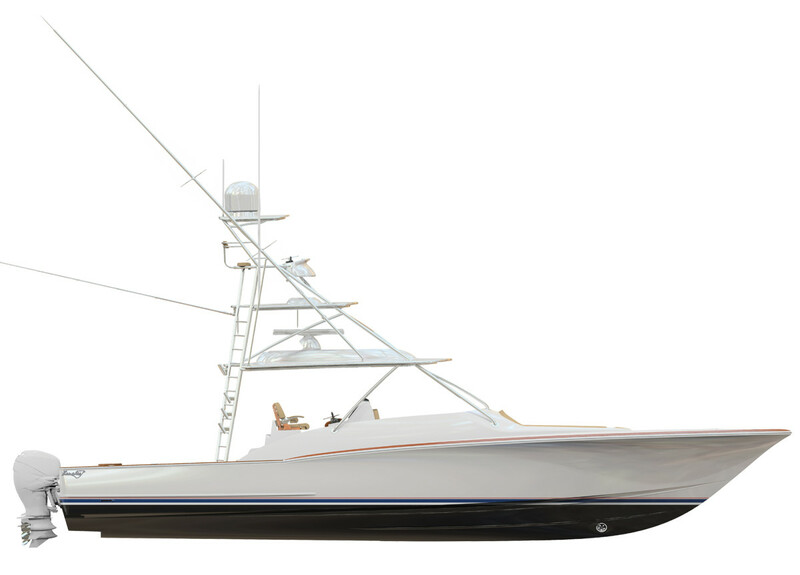 The 45 Walkaround stays true to the intermingling of style, with classic Palm Beach lines and the liberal bow flare attributed to her Carolina compatriots; a teak toerail, cockpit sole and helm pod keep things traditional. However, Bonadeo veered from the cold-molded vessels that inspired them by embracing the latest composite technology. The main structures utilize Kevlar, carbon fiber, e-glass and Core-Cell and are resin-infused and vacuum-bagged for a light, stiff result. 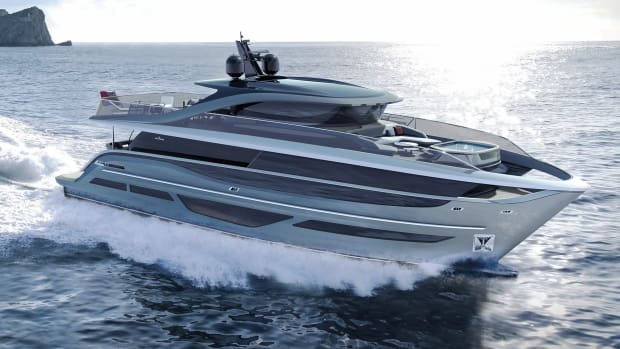 “We assemble the parts in the same fashion as a traditional cold-molded boat by bonding and fiberglassing the components together for one-piece construction that is unmatched in strength and feel,” Bonadeo tells me. 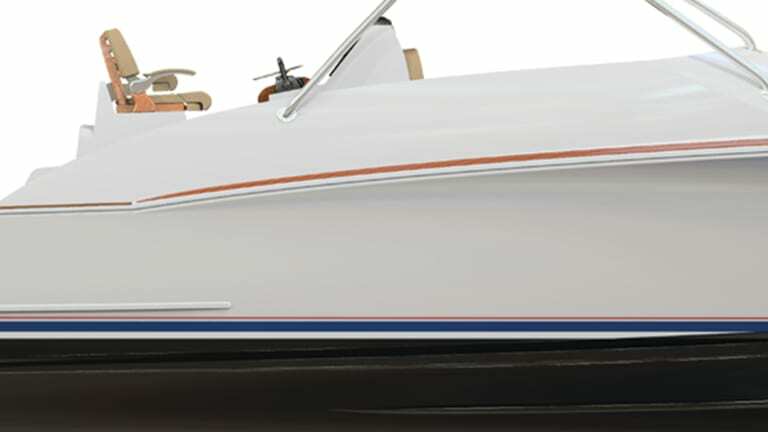 A modified bell-shaped, longitudinally stepped hull (Bonadeo compared the shape to the Texas longhorn’s namesake characteristic) will provide a soft, dry ride with the feel of a super deep-V while running, but with more stability at rest. While this may -result in a sacrifice of a few knots while wide open, the 45 is poised to take on rough weather at a faster clip in comfort. She’s ready to chase down big game too, with a 72-gallon livewell and two refrigerated, 6-foot-long fishboxes fed by an ice machine for the quarry. Three anglers can watch the baits on mezzanine seating that’s protected from the elements by a hardtop or from the tuna tower, well above the action. There are also outriggers and a plethora of rod stowage. Bonadeo tells me that while she can be fished hard, they envisioned Hull No. 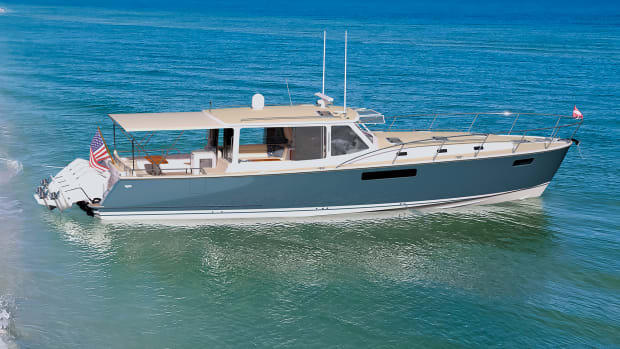 1 of the 45 series as a “lifestyle boat” ready for family adventure. 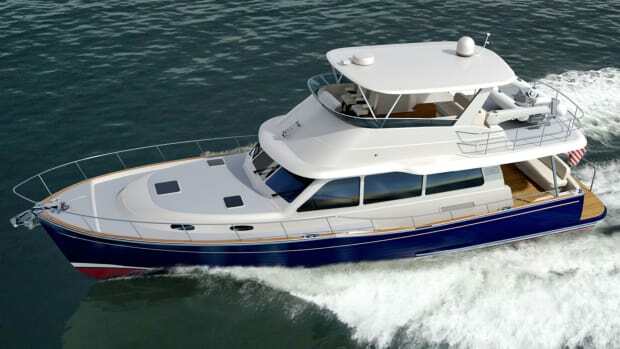 The air-conditioned bridge has seating for three at the helm; bench seating forward has room for three more, with easy access to chilled drink boxes and a wet bar to port. 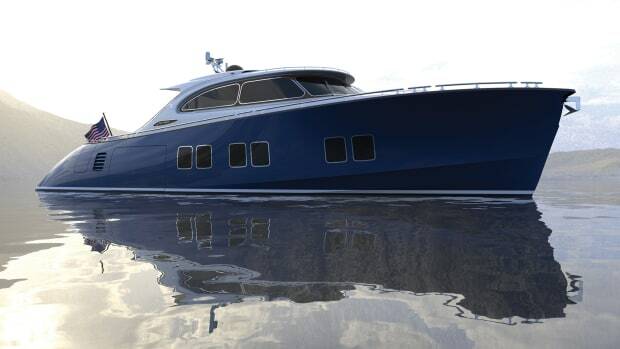 And there’s a sunpad and additional seating at her bow for five more revelers. For evenings on the hook, she’s got a full galley and can sleep four thanks to a queen berth in the forward stateroom and salon dining area that converts into a double berth. Quad 400-hp Mercury Verado Racing outboards are the -builder’s choice for the 45. “They have treated us and our customers very well for many years,” Bonadeo says of Mercury Marine. 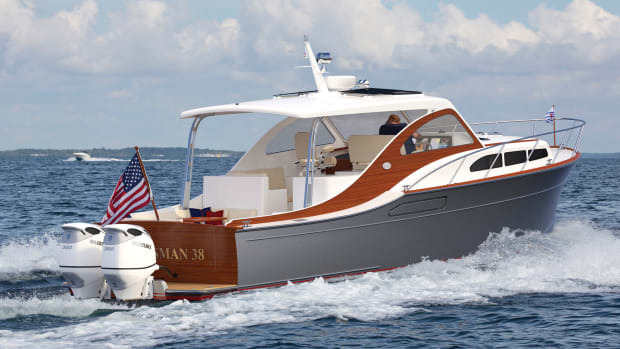 True to their custom yard mentality, outboard power options and inboard diesels are available by request. 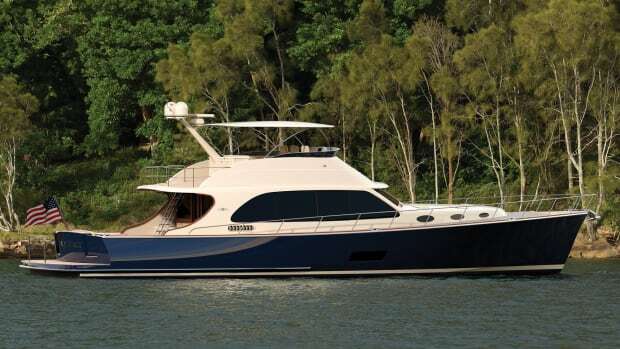 The builder aims to have the 45 ready to shine at the 2019 Miami boat show.